Saint-Raphael is home to more than 36 kilometres (22 miles) of Mediterranean coastline and four beautiful sandy beaches. Saint-Raphael is a seaside resort in an area of southern France better known as the French Riviera. The French Riviera is not only a major yachting and cruising area, but it is a favorite of tourists (more than 14 million annually), and for good reason. The region is blanketed in 300 days of sunshine each year and features beautiful a coastline, gorgeous beaches, 18 golf courses, 14 ski resorts, and more than 3,000 restaurants. Saint-Raphael is home to more than 36 kilometres (22 miles) of Mediterranean coastline and four beautiful sandy beaches for those who enjoy swimming, snorkeling, and/or scuba diving. Combine that with the area’s hot, dry summers and you can easily see why Saint-Raphael is a favorite of tourists. The warmest months are June through August, with average temperatures around 80 degrees. 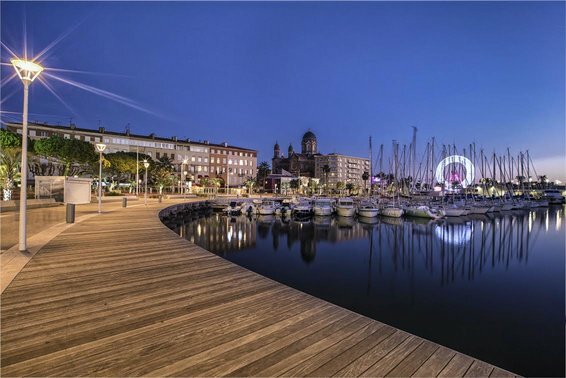 However, Saint-Raphael’s three ports – Vieux Port, Santa Lucia marina and Boulouris port – are alive with activities all year long. Tourists can rent a boat or charter a yacht and explore the French coast in all of its splendor. If you are more interested in land-based activities, considering renting cycles and exploring the city. Popular places to visit include the Route des Mimosas, the Notre Dame de la Victoire de Lepante Basilica, the Casino Barriére de Saint Raphael, San Rafeu Church, and the Museum of Prehistory and Underwater Archaeology. There is so much to see and do that you will struggle to find the time to do it all! So it certainly helps to have a plan or, better yet, a guide. For over 34 years, AESU has been the most trusted name in travel. We offer unique, exciting travel programs for college students and young professionals at affordable rates. Each trip is action-packed and informal – designed for people your own age. We are also able to design custom tours just for your group. AESU offers several trips to the French Riviera, including Cosmopolitan and Explorer. Dine in a quaint French bistro, explore Paris by night, relax on fabulous French Riviera beaches, and so much more. We also have groups that stay in Nice, Saint Raphael, and Beaulieu-sur-Mer. If you have any questions or want help booking your French Riviera adventure, please contact AESU by calling 800-638-7640 or fill out the contact form found on our website. This entry was posted on Thursday, July 2nd, 2015	at 7:21 pm	. You can follow any responses to this entry through the RSS 2.0	feed. Both comments and pings are currently closed.